Such a better week than last, thanks for all your well wishes! We are back to being a healthy household! My sweet mommy friends, I know you can relate when I tell you that today marks the beginning of the last week my baby is less than a year old! It is going to be an emotional week... With that said we have been super busy trying to get some house projects done before having close friends and family over to celebrate. Yesterday though I decided it needed to just be me and Gabriel time because I feel like I have been taking advantage of his ability to self entertain a little too much these last few days- boy did we have SO much fun! Cannot believe that my heart will just continue to grow for him AND have room for anyone if the Lord so chooses to bless us that way. 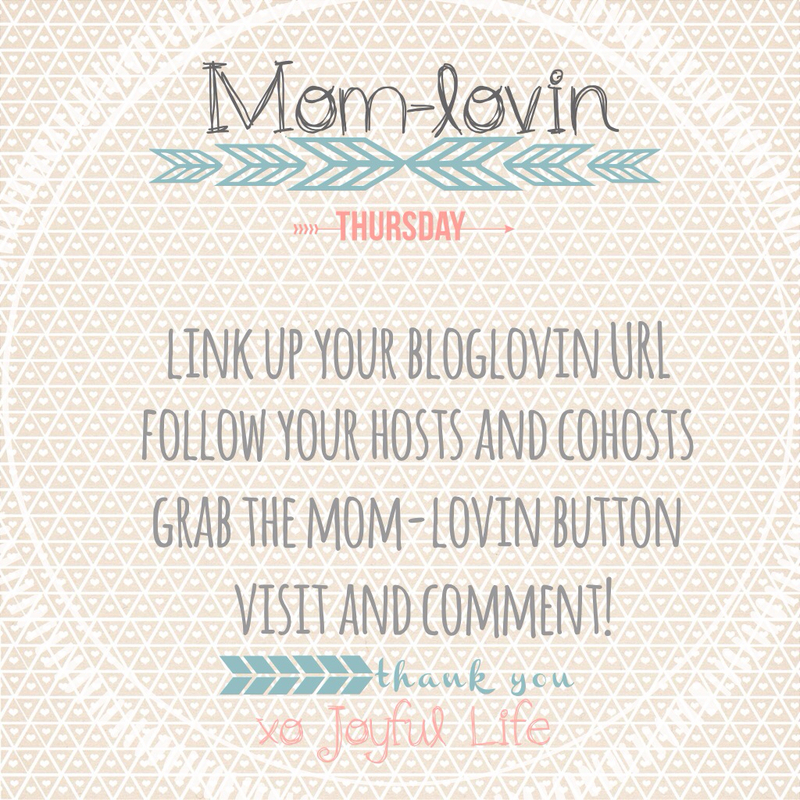 Without further ado, welcome to our Mom-lovin Blog Hop! 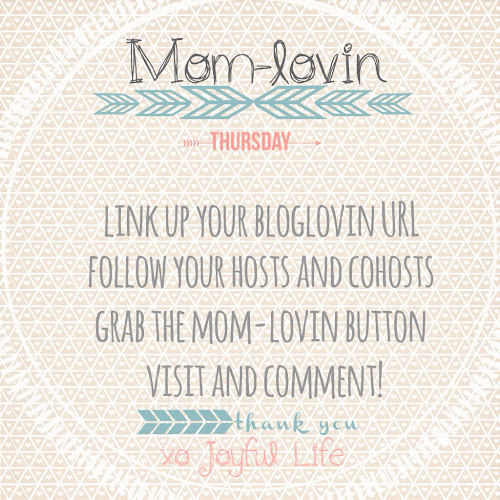 Link up your blog-lovin page (or blog) and meet and follow other mom bloggers! Don't forget there is a twitter section now too! With your host Hannah from Joyful Life and co-hosts myself (Lena) from Root and Blossom and Mia from Mossy JoJo . I just love, love, LOVE the title of his blog! She is a wife and momma to two little ladies and truly values living life to its fullest and being all you can be! 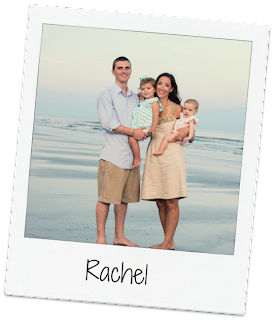 She (of course) blogs about her two leading ladies and everything in between be it health, beauty, food or anything else life throws here way. She recently signed up for her first half marathon which has given me another nudge to move towards checking off that bucket list as well! I'm excited to let you know that Hannah is featuring Aanie from The Active Mum! Don't forget to go read what Hannah has to say about this fabulous mama. So glad to hear you are feeling better! I'm so very excited to be featured this week, thank you both so much!!! Aw Lena, I know exactly where you are coming from with Gabriel turning one! I still have a couple of months but I'm so torn between being excited about planning a party and sad that my baby will no longer be a baby! Aw bittersweet! I'm starting to make a photo book of Hazels first year and it makes me so emotional! Haha! As always thanks for co-hosting with me! I can't believe he's one! I feel like I just read your birth story! Ben will be there so soon!! Also, I don't know if you got a chance to read my post today-but having that one-on-one time and being focused with our guys is so important and something I am striving to work on. I think you would enjoy the un-wired challenge! Oh, It's so bittersweet to watch them grow! I'm about to give birth to our second, and last, child, and I am painfully aware of how bittersweet the next year will be.